Please join us in one of our favorite places in the world, The City of Big Shoulders, Chicago, for two days of hands-on training in applied geochemical reaction modeling. Then, enjoy a springtime respite to take in Second City's architecture, theater, art, shopping, dining, and of course its hallmark Midwestern warmth and hospitality. Thank you for the amazing workshop! The presentations and hands-on exercises were tremendously helpful. I enjoyed it!!! Thank you very much for the workshop. It was intense but very, very clear and useful. The workshop will be presented by Brian Farrell. 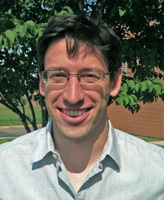 Brian is Lead Geochemist at Aqueous Solutions LLC, maker of The Geochemist's Workbench®. Brian Farrell has many years of experience in developing and applying geochemical and reactive transport models. He is expert in aquifer microbiology, geochemical modeling, and reactive transport in geochemical systems. Brian has taught short courses in North and South America, Europe, Africa, Asia, and Australasia. The meeting room is located within Chicago's famous Loop, overlooking the Chicago River and within walking distance of restaurants, hotels, parks, architecture, art, theater, and all Chicago has to offer. The venue is adjacent to subway stops on the Blue and Orange Lines, offering direct transit to O'Hare and Midway airports, as well as the rest of Chicagoland. If you choose to drive, a number of parking options are available close-by. We suggest using the SpotHero site to prebook parking at reduced rates. The workshop starts at 8:00 am sharp each day and continues to about 5:00 pm. Upon arrival in the ground floor lobby, please present ID at the security desk and request a pass to the “Geochemist&apos;s Workbench workshop” on the 4th floor. Please arrive with the GWB software installed and activated. If necessary, staff will be available for assistance a few minutes before the workshop. Space is limited, so sign up early. The registration fee of $699 includes all course materials. Full-time students currently registered in a university degree program can register at the reduced rate of $599. Please bring current student identification to the workshop. We are pleased to welcome back participants from our previous workshops at the special price of $599. For fastest verification, please sign up with the email address you used registering for the earlier course. Each registered participant will receive a free 60-day license to The Geochemist's Workbench® 12 Professional version. We will ask you to bring to the course a laptop with the software installed and running. Registrations may be transfered to another participant at no charge, and are fully refundable until 30 days before the workshop. Liability in the event of workshop cancellation or other eventuality is limited to refund of the registration fee. A number of hotels are located in the immediate vicinity of the workshop venue. We suggest checking the Central Loop Club Quarters, which offers clean and comfortable accommodations at a budget price, just a five minute walk from the workshop venue. The workshop's central Loop location is easily accessible from all of Chicagoland. The fastest and least expensive way to reach the venue from O'Hare and Midway airports is public transit. From O'Hare, take a Blue Line train to the Monroe subway station for only $5. From Midway, the fare is just $2.50; take the Orange Line to Quincy Station.